With the Postural Analysis, we can calculate just how much “We can make you better”.What is “Postural Analysis”? 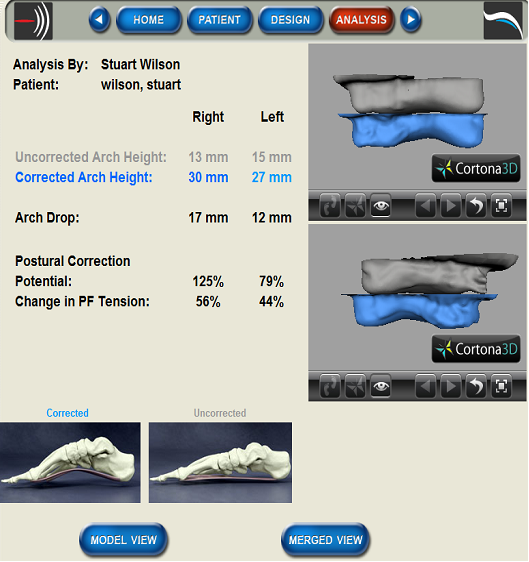 The Postural Analysis, or PA, is an evaluation process that uses a laser scanned image of each foot in both the “corrected” and “uncorrected” positions. We can measure exactly the difference in your arch height between these two positions. A digital model is also created that visually shows us the difference. In addition, the PA allows us to calculate the Postural Correction (percentage of potential change to the shape of your foot) and change in tension in your Plantar Fascia (tension of the soft tissue on the bottom of your foot).